The Paddle Steamer Waverley is an amazing ship and one of the best ways to see the Dorset World Heritage Jurassic Coast from the sea. Properly billed as “the World’s last sea-going paddle steamer”, Waverley has become an annual visitor to the Dorset Coast where every September she offers a range of excursions from, and around, Bridport, Weymouth, Swanage and other parts of the Heritage Coast. Built on the Clyde in the immediate aftermath of the Second World War, Waverley first sailed in 1947. But she carries the name of her predecessor who was sunk during the evacuation of the British Expeditionary Force from Dunkirk in 1940. The current Waverley was built and designed as a steam packet boat and served many years in that role around the coast and lochs of Western Scotland. The last Clyde paddle steamer of her ilk, she was eventually “pensioned-off” and sold for £1 to the Paddle Steamer Preservation Society in 1974. Realising that the true beauty of steam machines is to see them in action the preservation society struggled hard to get Waverley shipshape again and operating as a tourist attraction in her native waters around Scotland. But they soon found that her uniqueness made her a great attraction in other parts of Britain too. Today, having undergone a massive (and no doubt expensive) rebuild which was completed in 2003, Waverley spends the summer plying her trade in the lochs of Scotland and much of the rest of the year as an itinerant attraction all around the coast of Britain. Visitors to Dorset get their “go” at steam-paddle-powered navigation just as the main holiday season is drawing to a close. And it’s a wonderful opportunity not to be missed. You don’t have to be a steam-buff to appreciate the special nature of a trip on the Waverley. Many, perhaps most, of her passengers wouldn’t know and maybe couldn’t care that she is powered by a triple expansion steam engine. But all will certainly appreciate the unique sights, sounds and smells that result. This is a different way to travel, from the moment the ship appears on the horizon to the moment you step off her gangplank to leave, you’ll know that you are doing something different and truly special. On deck or below, you can appreciate the skill and craftsmanship that went into building, rebuilding and maintaining this beautiful, but workaday ship. Gleaming brass, varnished woodwork and perfect paintwork are all around, along with the smell of hot metal and steam. But don’t expect masses of noise. There is some, but mostly the gentle rhythmic “slap-slap-slap” of the paddle wheels and the hiss and sigh of steam and pistons. What you won’t hear is the sound of stokers shovelling coal as for almost all of her working life, Waverley’s boilers have been fired by oil. This makes for a slightly disappointing lack of smoke from her two red funnels, but on the plus side it means you can enjoy your journey without being choked by smoke or showered with smuts. There’s plenty of space below decks to eat, drink and enjoy the trip and the scenery, but in fair weather the best seats “in the house” are definitely those on the decks outside where you can enjoy the magnificent coastline, take in the sea air and enjoy the sun. 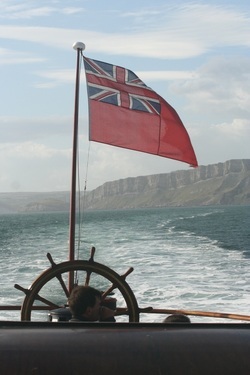 And on a good day, what could be better than cruising in an historic paddle steamer along the awesomely rugged and beautiful Dorset Coast. It may not be the lochs of Waverley’s home patch, but it is a World renowned coastline of immense beauty in its own right. From the comfort of Waverley’s decks or saloons you can follow every twist and turn of the Jurassic Coast rocks and see the changes in landscape that each rock-type brings. Yes, there are other ways to see the Jurassic Coast, but few can be as special, or as relaxing as viewing this unique coastline from a unique ship. Waverley herself may not have lasted the 185 million years that the Jurassic Coast represents, but she has certainly seen her share of tough times and challenges. And like the Jurassic Coast, she has changed and adapted to new circumstances and come out looking as good, if not better, than ever. 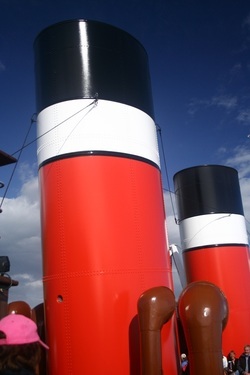 So if steam is your thing or even if it’s not, you can’t go far wrong by enjoying a day or a few hours cruising a prehistoric coastline in the historic Clyde packet paddle steamer Waverley. She’s well worth your support. And the rewards will be mutual. You’ll have a uniquely enjoyable day out and she’ll gain much needed funds to ensure that there remains at least one sea-going paddle steamer left in the world. For more details and schedules, click here. Visitors to Dorset get their “go” at steam-paddle-powered navigation just as the main holiday season is drawing to a close. And it’s a wonderful opportunity not to be missed....​"